As the owner of numerous lidless casserole dishes, incomplete sets of crockery and a collection of odd glasses I empathise completely with my forbears the remnants of whose kitchen disasters remain for all to see on the foreshore. 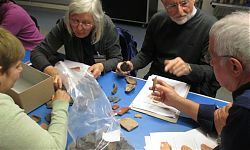 However, although I was aware of the vast quantities of potsherds to be found there, I had only the most general idea of the period to which they belonged and the way they were produced and what utensils they might originally been part of. I was, therefore, really interested when I saw that the TDP was putting on a pottery workshop for members of the FROG on Saturday 18th May and duly signed up. I realised straight away how very, very, limited my knowledge and understanding of this whole field of expertise was but it is to the credit of the clear, lucid and practical presentations that took place during the day that I now have an overview of the various periods of pottery making, the processes by which different wares were made and their designs and uses. 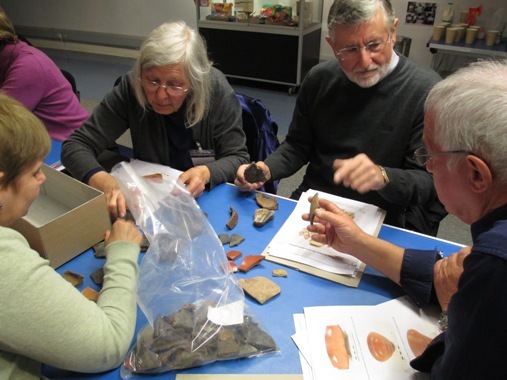 We began with a session on Prehistoric pottery led by Jon Cotton whose introductory background proved fascinating. As one might have expected, it appears that pottery skills, one of the top ten technological processes, were likely to have been the preserve of women. Basic clay needs temper or filler to allow moisture to escape and each potter probably had their own clay ‘recipe’ which was passed down through the family. Prehistoric pottery can be identified by looking for traces of this temper which might be crushed flint or bone, recycled broken pot or sand. With no kilns or wheels this hand- made pottery was bonfired and so uneven in colour and decoration could be made with various tools or fingers. The evidence of temper and/ or decoration are clues to look for when identifying prehistoric pottery. Jon then produced numerous examples for us to look at so we could try to relate them to what he had told us thus giving us an idea of what we should be looking for on the foreshore. 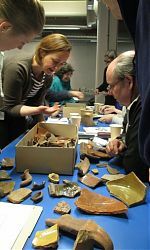 Jon’s talk covered thousands of years so it would seem that Fiona Seeley from Museum of London Archaeology had a simple task of conveying the nature of Roman pottery over 350 years. Not so, the Romans, being Romans, had a much wider range of products for both domestic use and trade and have left vast quantities of fragments behind. Their products were highly standardised across the Empire and the majority, but not all, were wheel made, sand tempered and unglazed. We also learned about some of the key different items the Romans produced: flagons for holding liquids are most commonly of white fabric and from the early Roman period cAD50-160 and amphorae, for transporting products such as wine and olive oil extended across the whole period but differed in both form and use over time. Amphora sherds can be mistaken for curved roof tile but are distinguishable as the interior of a roof tile has a sandy, rough surface. Mortaria or mixing bowls have grits on the interior and some fineware had a layer of mica on the surface to imitate bronze vessels. This aspirational attitude was typical of the Roman household and Samian ware with its distinctive red glossy surfaces was common in London and was copied by several Romano-British producers. Black-burnished wares, developed from earlier Iron Age traditions, were first hand made and later wheel made with various kinds of decoration. This lecture provided a fascinating overview and was again accompanied by the opportunity to look at and handle examples. 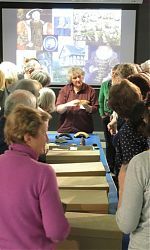 Jacqui Pearce probably had the most daunting task; in a talk entitled Medieval and Post- Medieval Pottery she took us from c900 to 1901 with all the technological innovations that has involved. She began with the Saxo-Norman potters who, eschewing Roman sophistication, had reverted to mainly hand- made, bonfired, unglazed pots in a limited range. During the medieval period the range of pottery items which were now largely wheel thrown, glazed and highly decorated increased. She continued into the 16th and 17th centuries which saw more imports from France and Germany; white earthenware from the Surrey/Hampshire border and red earthenware from the London area; clear or green glaze, tin glaze and slip decoration which made these items more attractive and colourful. The Georgian and Victorian periods saw the development of mass production, creamware and pearlware, transfer- printed ware, English porcelain and imported Chinese porcelain. 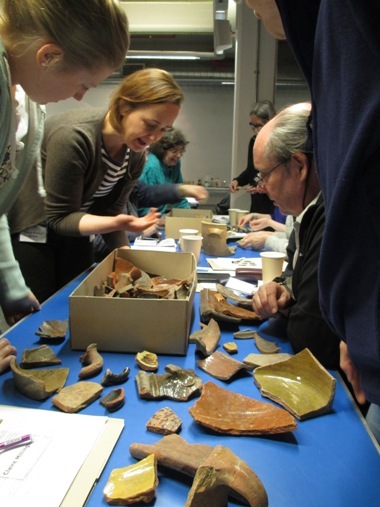 It all seemed quite obvious and straight forward until our group was confronted by a box of blue and white sherds with the suggestion that we could sort them by period and technique. There was A LOT of discussion and many questions asked!! Obviously this was an introductory session but it was highly stimulating and interesting and this was in no small way due to the clarity with which the three experts presented their material. Thanks must go to Jon, Fiona and Jacqui, and to Courtney for organising the whole event. Talking to others about the day suggests that they, like me, are anxious to get back to the foreshore and do some serious searching. So if you see thirty FROGs on hands and knees, peering at the foreshore and surrounded by the very helpful handouts we were given and referring to books form the book list you will know that we are trying to put theory into practice!